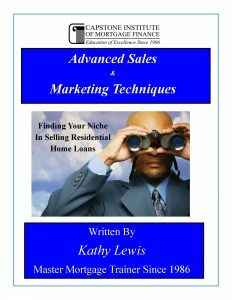 You must know how to use some type of financial calculator in mortgage lending. This is a 3-hour training class and not a YouTube 5 minute demo which includes its own manual and case studies with exercises. If you’re already a math major or engineering student you probably already have a gadget calculator with lots of whistles and bells. But what about the rest of us who sometimes have troubles just balancing our checkbook? 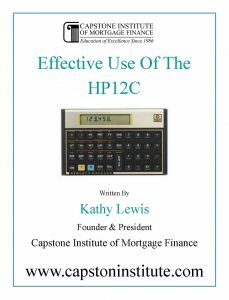 Every loan originator must learn how to use a handheld mortgage calculator. There are 2 questions in selecting a financial calculator? 1st: What’s your budget for purchase? 2nd: Who’s going to train how to use it. Everyone going to say, buy this or buy that because that’s what they brought. But are they going to sit next to you as you learn all the tips, tricks and bypass functions? This isn’t a quickie YouTube video. Power on Power off – Kathy actually spent a week going through the HP12C consumer manual and then called HP’s tech support. They weren’t that helpful answering questions; so she designed her own instructional video that’s easy to follow and shows you all of the HP12C capabilities. This video allows you actually see how all the function keys work and how they apply to mortgage calculations and a few more tricks.